How did the series of poems in Earth Lust start—with a phrase, a sentence, a character, or something else? It started with a quote from Rebecca Lee’s book Bobcat and Other Stories: “If I were willing to see the simplicity, the purity, of my own desire, then I also had to see the entire landscape—the way desire rises from every corner and intersects, creates a wilderness over the earth.” At the time I read Lee’s book, I was also reading Woman and Nature: The Roaring Inside Her by Susan Griffin, which discusses woman’s body as a landscape man wants to tame. The two merged to make me consider how women navigate the landscape of desire within our culture. I love that Earth Lust is influenced by fairy tales and includes a retelling of “The Maiden without Hands.” Were you ever scared to experiment with retellings? Yes! I admire the work of many contemporary women writers who experiment with retellings, so I wasn’t sure if I was up to the task. I was a Classical Studies major in college, and attempted to retell various myths during an independent study with a poetry professor in my senior year. At the time, this work turned out to be more difficult than I thought; I did not take into account that I would have to re-imagine the story to retell it. I put that work aside, uncertain if I would ever pick it up again. 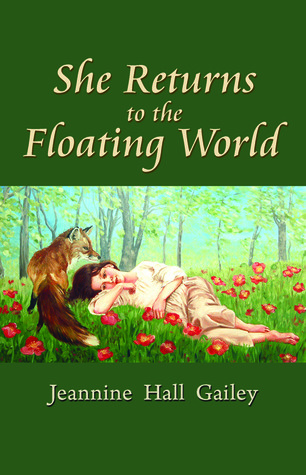 About four years ago I started reading the work of Jeannine Hall Gailey. I fell in love with She Returns to the Floating World, her collection of Japanese fairy tale poems. Gailey rekindled my interest in retellings. Since then, I’ve been paying attention to the retellings of other writers, but I never thought I could do it, or that I would be able to find a way to retell fairy tales that would be interesting to me, let alone anyone else. There’s such a rich history of this work in literature, be it myth or fairy tale, and I wasn’t sure I had anything to add to the conversation. If it weren’t for Susan Griffin, I don’t think I would have had the desire to get started. I needed to have a fire lit under me to take on such an historical task. Marriage is a theme in Earth Lust. How does motherhood inspire your work? Is it difficult to balance family life with the writing life? Since I am the mother of a daughter, I am constantly reminded of the transitions women make from girlhood to womanhood. When my daughter was an infant and toddler, I thought more about the bond between mother and child. Now that she’s older, I find myself thinking about adolescence and the early years of womanhood. Much of what my daughter experiences inspires me to think and write about my own past, but also how women connect through shared experiences. It can be difficult to balance family life with writing life. I’ve learned to adapt, as every age has its own challenges. I learned early on to take spare moments when they presented themselves, so now I can write whenever I have free time. In Earth Lust I adore the tension created in the chapbook by the line, “Off to the side were other roads.” Can you talk about desire and longing in this collection? I wanted this chapbook to look not just at the ways we navigate desire, but also at our own desires. While there are poems about the dangers of desire, there are also poems about the longing to be noticed as well as what outsiders think we should want. If we don’t want the things we’re told to want, how then do we live our lives so they reflect what we value? And how do we inch out of the expectations of others? The characters in these poems are caught up in societal roles but many of them break free: the Minstrel’s Daughter chooses to live in the forest, away from her father, and the Woman without Hands finds a way to have physical contact with her infant even though her hands have been taken from her. A woman puts herself in a vending machine by choice: it is her only escape from the colorless countryside in which she lives. These other roads are opportunities the characters take, if only by moonlight. Who were the writers you admired when you first started writing? Sylvia Plath, Anne Sexton, Randall Jarrell, and H.D. What is inspiring you these days? The stories of Franz Kafka and Lydia Davis. Sherlock. Photographs of abandoned houses. How are you trying to get better as a poet? By experimenting and writing outside my comfort zone. I like to challenge myself as a poet. I can only hope it improves my writing! Your chapbook credo: Little books give poets the chance to experiment. Your chapbook wish: That more people read chapbooks. It’s a great way to be introduced to the work of a poet. Chapbook Bio: Julie Brooks Barbour is the author of Small Chimes (2014) and two chapbooks: Earth Lust (forthcoming 2014) and Come To Me and Drink (2012). She is an Associate Poetry Editor at Connotation Press: An Online Artifact and Poetry Editor of Border Crossing. She teaches composition and creative writing at Lake Superior State University.